Samsung and Google have launched two new products that will run Google’s Chrome OS, the Samsung Chromebox and the Samsung Series 5 550 Chromebook. According to Google, both of these device are faster than the previous devices running Google’s Chrome OS, and the Chromebox comes with an Intel Core processor, 4GB of RAM, dual band Wifi 802.11 a/b/g/n, two DisplayPort++, DVI, and Bluetooth 3.0. 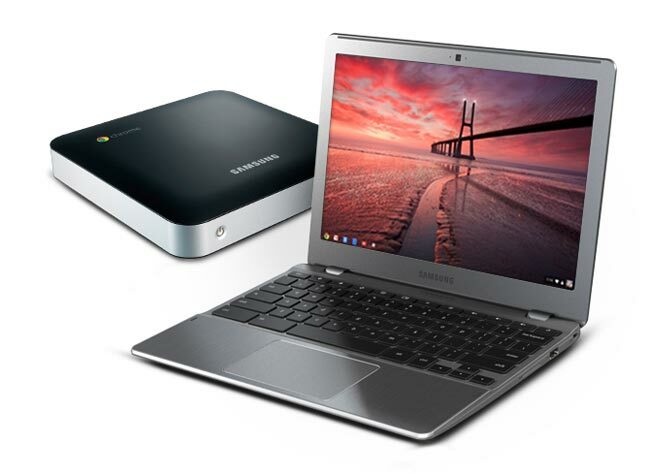 The Samsung Series 5 Chromebook features a 12.1 inch display with a resolution of 1280 x 800 pixels, processing is provide by an Intel Core processor and there is also 4GB of RAM, a built in web camera, WiFi, USB Display Port+++ and a 4 in 1 memory card reader. Both the new Samsung Chromebox and the Samsung Series 5 550 Chromebook will be available in the US and Europe with the next few weeks.